Rothschild & Rockefeller – ttskr. THE ONE WAY TO NON-VIOLENTLY TAKE DOWN THE ROTHSCHILD CRIME FAMILY, IS TO REINTRODUCE THE GLASS STEAGALL ACTWHICH CLINTON REPEALED IN 1999. ~ Honduras Did It, The United States People Will Too: Rush Limbaugh ~ Boot The Communist Impostor! 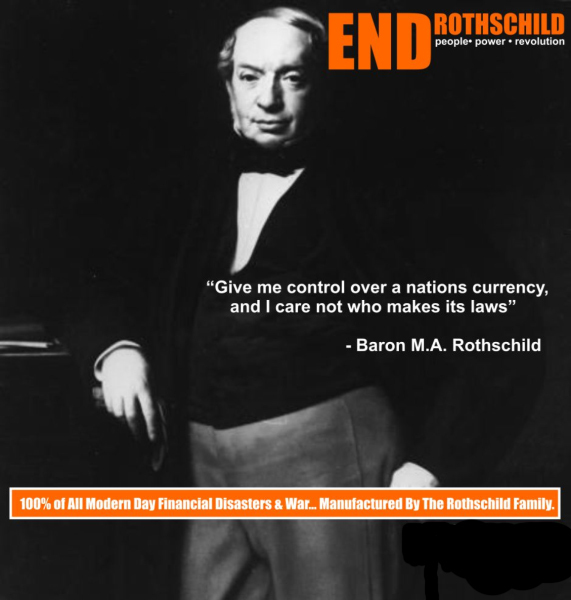 Earth’s New World Order: A Marketer’s Dream ~ Rothschild’s Merchant Bank! These links are related. This testimony and documentation from Tatum is proof. Yes, proof. Names, dates, crimes. Murders. International intelligence agencies are partners in crime, serving the Rothschild network. Eustace Mullins provided the money side, the corporate side, the government side to all this. And Tatum provides the intelligence side. Together, full and comprehensive proof. Tatum names many names, provides documents, tape transcripts, and knowledge you need. As a general rule, we don’t trust any “ex” CIA operative. Why believe this one? Why did he spill? Because the government betrayed him again — and his wife. He provides documentation. Everything seems to fit. This is the best place to begin watching Tatum on video. Furthermore, here’s Tatum’s book: The Tatum Chronicles, which he self-published. With supporting photos and documentation. A treasure. c. The interviewer in the Tatum videos is retired Los Angeles FBI official Ted Gunderson. Here’s Gunderson’s website. But there are problems. Gunderson is pushing Ron Paul for president in 2012. (See our article “Ron Paul: Fool’s Gold.”) Also, Gunderson is allied with Alex Jones (see the NOT-Recommended Links section below). Gunderson displays on his homepage a quote of support from F. Lee Bailey, infamous attorney. And, well, Gunderson was very high in the FBI. Is he really “ex” FBI? Retired, yes. But “ex”? I’m no longer willing to give him the benefit of the doubt. If you are, ok. Yes, he says a lot of nasty truth. But what is he doing to mislead us? And what doesn’t he say? — such as the ultimate in money, the Rothschilds.